For Ashlee Czapla, growing up in small town Lake Zurich, Illinois lead to the growth of a big imagination. Ashlee’s passion for writing and communications inspired her to pursue an education at the University of Missouri’s School of Journalism. While in school, Ashlee worked various social media and digital marketing internships for music venues, festivals, publications and more. 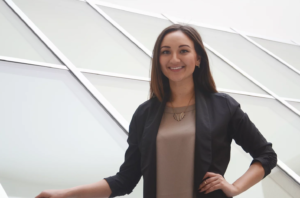 After graduating with a degree in journalism and minor in business marketing, Ashlee was hired as an account manager at a programmatic media buying agency in Columbia, Missouri. In addition to her job as an account manager, she also dabbles in event planning and does freelance writing, photography and marketing consulting on the side. Ashlee has always been a people-person and views communication as the thread that weaves society together. Through words, media and music, Ashlee hopes to connect the masses to create shared experiences through positive messages. Ashlee is Wysidio’s Digital Marketing Manager and oversees all things pertaining to social media marketing. From promoting content to connecting with audiences, Ashlee manages the day-to-day social presence of Wysidio and LTD Brands. Ashlee works across channels and teams to communicate and cultivate conversations on current events within the music world.